It is hard to imagine that it is now nearly 28 years since Sunday Silence provided Halo with his second victory in the GI Kentucky Derby, with his defeat of Easy Goer. Since then, of course, 1989’s Horse of the Year has earned recognition as one of the great sires, so it is highly appropriate that he is the grandsire of Epicharis, the unbeaten colt best placed to take the Kentucky Derby berth available to a Japanese challenger. Epicharis’s victory in the Hyacinth S. was his fourth from four starts, all on dirt. Before we go much further, it may pay to take a general look at dirt racing in Japan, which could be described as turf racing’s poor relation–at least in terms of opportunities. Using last year’s International Cataloguing Standards, I can tell you that Japan staged 128 graded races, plus a further 98 listed races, for a total of 226 black-type races. However, only three of the 23 Group 1 races–the February S. the Champions Cup (formerly Japan Cup Dirt) and the Tokyo Daishoten–were contested on dirt, together with only one of the 36 Group 2s and 12 of the 69 Group 3s. That’s just 16 graded races among a total of 128. It is a different story at listed level, with dirt accounting for 57 of the 98. Applying the International Cataloguing Standards, rather than the local gradings, the 2-year-olds have just four listed dirt races available to them, with no graded races, and the 3-year-olds have only two options–the G3 Leopard S. and G3 Unicorn S.–which are not also open to older horses. The Japan Dirt Derby carries only listed status (though Group 1 locally) and its prize-money in 2016 was given as ¥76,500,000, compared to the ¥432,000,000 carried by the turf Derby, the Tokyo Yushun. All this needs to be taken into account when assessing the record of Epicharis’s sire, Gold Allure, who was part of the all-conquering stallion team at Shadai until his death last week at the age of 18. At 16.3 hands, Gold Allure possessed the size and strength we came to expect of the Hail to Reason male line. With limited opportunities available on dirt to a young horse, Gold Allure made his first six starts on turf, winning only one of them, over a mile and an eighth as a 2-year-old. Switched to dirt, he won at Hanshin and Kyoto before being returned to turf for the 2002 Tokyo Yushun. Although he was sent off at odds of 47-1, Gold Allure performed with plenty of credit, coming off worst in a four-way photo for second place behind Tanino Gimlet. He was beaten only a length and three-quarters, which made him a good thing for the Japan Dirt Derby on his next start. He duly won and then added the Derby Grand Prix, another race which carried local Group 1 status. Gold Allure rounded off his 3-year-old campaign with success in the Tokyo Daishoten. The son of Sunday Silence then won the first two of his three starts as a 4-year-old, including the G1 February S. In other words, he won two of the three dirt races which currently carry international Group 1 status and his record on dirt stood at seven wins from nine starts. Aspects of his record raises the possibility that there were–or are–some differences between the dirt tracks in Japan and the U.S. It is many years since I went racing at a Japanese dirt track, so I am no expert, but Gold Allure’s times for his three important wins over 2000 metres make me wonder if the tracks are deeper or slower. These times were 2:04.1, 2:08.1 and 2:05.6, even though 2000 metres is slightly shorter than a mile and a quarter. Gold Allure was always popular during his fairly lengthy stallion career, his smallest book being 132 mares and his smallest crop being 83 foals. He twice covered more than 200 mares in a season. He has 1,095 foals aged three or over and it is here that you need to factor in the comparative lack of opportunities on dirt in Japan. He has only eight internationally recognised graded stakes winners, but they include Gold Dream (winner of the G1 February S. two days ago), Espoir City (G1 February S. and G1 Japan Cup Dirt), Smart Falcon (G1 Tokyo Daishoten) and Copano Rickey (G1 February S.). Then there’s two others which have won races classified as Group 1s in Japan–Chrysolite, winner of the Japan Dirt Derby, and Oro Meister, winner of the Mile Championship Nambu Hai. Now we have Epicharis, who was rated the best dirt 2-year-old of 2016, with a rating of 110, just 5lb below the top-ranked turf colt Satono Ares. With help from this distinguished team of dirt performers, Gold Allure has done well virtually from the off. His first progeny raced in 2007, since then he has topped the table of dirt sires in 2014 and 2016, as well as finishing runner-up in 2009, 2010, 2011, 2012, 2013 and 2015. Epicharis’ dam Stapes Mitsuko raced mainly on turf, as might be expected of a daughter of Carnegie, a G1 Prix de l’ Arc de Triomphe winner by Sadler’s Wells. Her only win came over six furlongs on turf. Epicharis is her seventh foal, with all seven being by one or other of Sunday Silence’s sons. Her best previous effort was Meisho Naruto, a Heart’s Cry gelding who was a dual Group 3 winner over a mile and a quarter on turf. The second dam, Martin Miyuki, was by Maruzensky, a close relative by Nijinsky II to Caucasus, a high-class stayer in Europe and America. Martin Miyuki gained all three of her wins on dirt, including two over a mile and an eighth. She also ranks as the third dam of A Day In The Life, a Group 3 turf winner over a mile and a quarter by Deep Impact. This is also the family of Little Amapola, winner of the G1 Queen Elizabeth II Commemorative Cup over 1 3/8 miles in 2008. Sired by Sunday Silence’s son Agnes Tachyon, Little Amapola shares the same third dam–Miyuki Kamada–as Epicharis. There is plenty of stamina in the bottom half of Epicharis’s pedigree, including stallions which won the Arc, the Kentucky Derby, the St Leger and the Washington D.C. International. This suggests there could be improvement to come from Epicharis when he finally stretches out to a mile and a quarter. 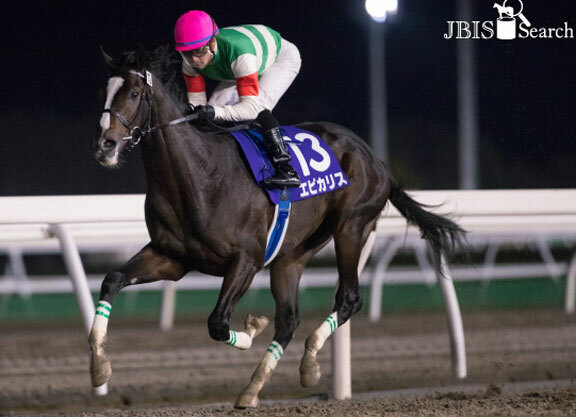 Although his recent Hyacinth S. success came over a mile, two of his three juvenile wins were gained over a mile and an eighth, including the Hokkaido Nisai Yushun (Group 3 in Japan, but listed internationally).